The First Annual Andrew Chamblin Memorial Lecture was held at 7:30 pm on Thursday, April 16, 2009. 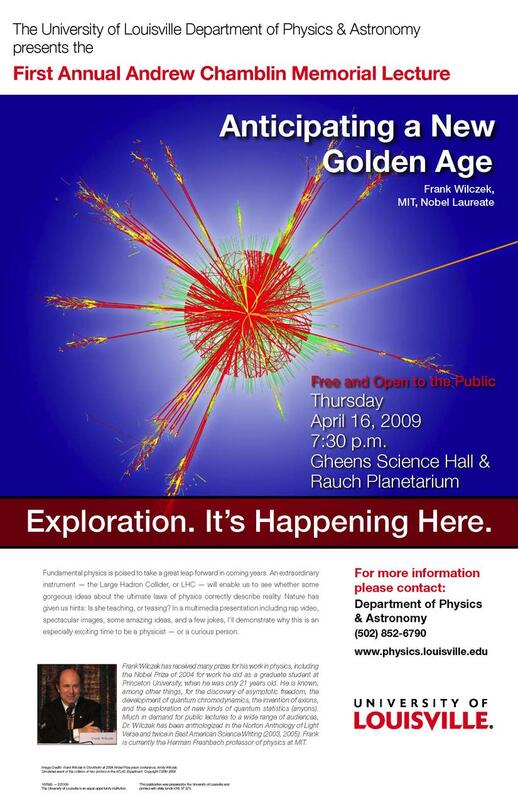 The talk was presented in the Rauch Planetarium to a double-overflow crowd estimated between 350 and 400 persons. The lecture is available as streaming video here. Thanks to everyone who helped make the event a success. Frank Wilczek was a guest on WFPL's State of Affairs program on Thursday, April 16 at 1:00 pm. Listen to his interview here. Please join us as we celebrate the life of Dr. H. Andrew Chamblin, who was Assistant Professor of Physics at the University of Louisville until his untimely passing in 2006. We welcome as distinguished speaker Nobel Laureate Dr. Frank Wilczek, Herman Feshbach Professor of Physics at MIT. You can learn more about Professor Wilczek at www.frankwilczek.com.